In this expanded and thoroughly updated second edition, Michael A. Harvey elaborates his pioneering biopsychosocial model of the effective assessment and treatment of deaf and hard-of-hearing clients in individual and family therapy. Taking a broad ecological perspective, he examines the influences of larger networks on the individual and vice versa, and illuminates the overt and covert conflicts among family members, school and vocational rehabilitation personnel, and friends that often exacerbate problems. The spiritual issues relevant to those who have experienced any kind of loss receive special attention in the new edition, as do the daily hurtful exchanges in the lives of the deaf he sums up as "ordinary evil." 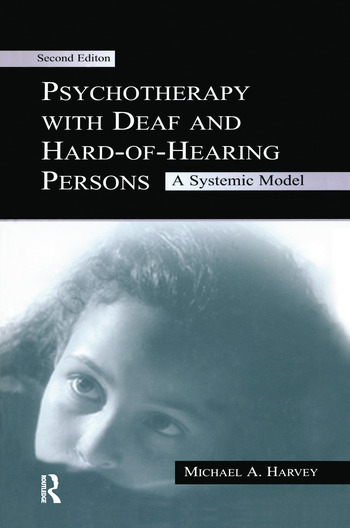 Throughout the reader-friendly text, theoretical description is balanced with practical advice; points are vividly illustrated with extended verbatim transcripts from actual therapy sessions and with exchanges in the author's question-and-answer column in the journal, Hearing Loss: Self-Help for the Hard of Hearing. Psychotherapy With Deaf and Hard-of-Hearing Persons, Second Edition, is essential reading for all mental health professionals who see even occasional clients whose lives have been affected by hearing loss in themselves or in family members. Contents: Preface. Introduction. A Systemic Model. Life-Span Development of the Deaf Ecosystem. Life-Span Development of the Hard-of-Hearing Ecosystem. Treating the Hard-of-Hearing Individual in Context. Treating the Deafened Individual in Context. On Joining the Deaf Client. The Communication Logistics. The Use of an Interpreter for the Deaf in Family Therapy. Hearing Children of Deaf Parents. Involving the Vocational Rehabilitation System. Coping With Ordinary Evil. "This book is one of the few to understand the varying dynamics related to the ecology of deafness and provides important insights into working with people with impaired hearing." "...down-to-earth discussion of a variety of cases that illustrate the effects of impaired hearing on symptomatology and the therapeutic process. This text should have wide circulation."